Two years ago, at some ungodly hour of the morning, I was scrolling through my Tumblr feed. At the same time, 2,600 kilometres away, a girl named Kate also happened to be scrolling. She made a comment on a queer-related post that popped up on my feed and, on a whim, I decided to send her a direct message and strike up conversation. At the time, Tumblr was the place to be for LGBTQ+ people who were looking for TV shows and web-series featuring queer characters, and as a gay girl who had recently come out, heaven knows I was desperate for queer content. Since that day, we haven’t gone more than 24 hours without a text or a Facetime call. Pursuing a relationship that relies on high-speed internet carries a wide range of potential issues. In the early days of our friendship, when the first season of Netflix’s Stranger Things was released, my now best friend and I decided to watch it together. Of course, we couldn’t just sit next to each other and share a bowl of popcorn, but we made do with what we had. We each got our snacks, curled up in our beds with our laptops, and pressed play when the minute changed on our different clocks. However, being a country apart from each other wasn’t the only problem. A huge rainstorm was rolling through my city that night and, every ten minutes or so, my power would go out and I would lose connection. Every time it happened, my new friend would pause Netflix and wait for me to come back so we could watch together. That’s when I knew she was a keeper. While sites like Tumblr, Twitter, and Instagram are so often the basis of online relationships — both platonic and romantic — ultimately, I think it’s the effort that’s put into communicating with one another that keeps the relationship going, not the medium through which you choose to do it. Social media platforms have revolutionised the ways in which relationships develop. Whether it be to share a tweet, an article, or just a text, they allow us to keep our friends in our pockets at any given time, no matter where in the world we are. Just like in any relationship, communication is vital. I find that relationships that develop via the interwebs are often stronger because they require steady communication to even begin. In a way, social media tethers us to those we love. Over our two years of friendship, Kate and I have developed an arsenal of online methods to keep our friendship going strong, despite being so far away from one another. Skype and Facetime came first. 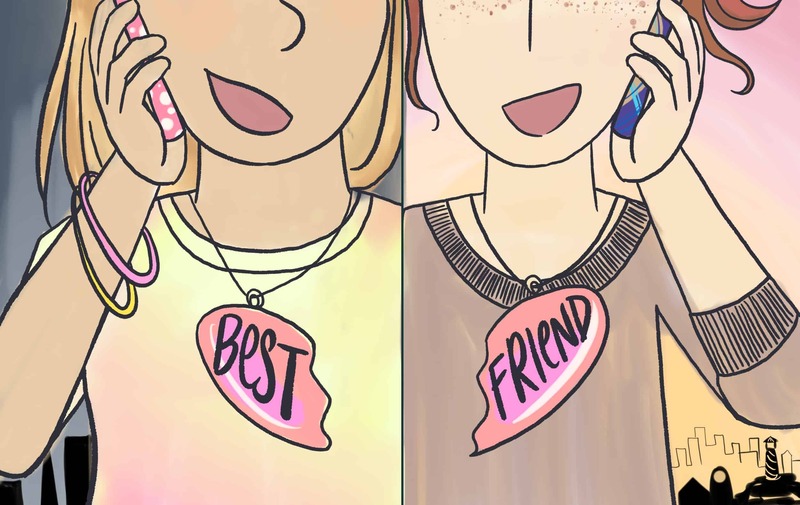 We often call each other just to hear each other’s voices at the end of the day. Just yesterday, while Kate was sitting in a train station waiting for the 10:25 pm train, she called me to tell me about her day at New York City Pride. It’s the little things. Then there are streaming websites like Rabbit, which have allowed us to watch movies together without having to sync up the time on separate screens. Of course, we found this one after our Netflix debacle of 2k16. We’re very lucky, as our time zones are only one hour apart. I have other friends from around the globe who are six, seven, or eight hours ahead of me. Steady communication is difficult in many of these circumstances, especially considering the fact that maintaining a strong emotional connection requires a lot of work from everyone involved. Messaging apps such as Whatsapp permit texting and voice messaging between people using different types of cellular devices and service providers. When you’re going to bed as your friend is waking up on a different continent, dropping a voice note about your day can help keep that connection alive. I even do this with Kate during the school year when lecture notes and readings have me up at 4:30 am, or when I want to grumble at her for not playing me back on Words with Friends. Interrupted internet, time zones, and Netflix mishaps aren’t the only challenges that online friends face. As ridiculous as it is, some people view relationships that are established online as less real than ‘real life’ ones. And why not? Purely because we don’t get to spend time sitting next to each other in a crowded theatre or text each other from across the kitchen table. It can be quite difficult to get over the hurdles thrown your way by skeptics of online friendships. But for Kate and me, being far apart is a huge contributor to the strength of our bond, because we don’t get to see each other very often. She’s the best person I’ve ever had the privilege of knowing, and people like her are incredibly difficult to find — of course, she had to be 2,600 kilometres away from me. For those of you who have friends and loved ones even farther away from you, you don’t have to be apart forever. Kate and I had the chance to meet ‘in real life’ last summer when I was attending a conference in New York, and soon, I’ll be flying back to the city to spend two and a half weeks with her and her family. Rainstorms and lagging internet can be a challenge, and we may bicker like an old married couple from time to time, but I thank my lucky stars for her every day. Sometimes, all that’s needed to spark a friendship is a little 2:30 am sleep-deprivation courage, and a private message from across the world.